Sacré Cœur is in Paris’ 18th arrondissement. With nearly 10 million visitors a year, Sacré Cœur is the second most visited monument in Paris after Notre-Dame, which receives 14 million visitors, according to a 2013 ranking released by the Paris Tourist Office. If we head back in time, Montmartre hill was a sacred place for Gaul druids and Romans, who built temples dedicated to Mercury and Mars. It later became a site of Christian worship, as evidenced by the rebuilding in the 12th century of the oldest church in Paris, the St. Pierre Church, built by King Louis VI and his wife Adelaide of Savoy. Sacré Coeur was erected at the end of the 19th century. It took 44 years to build the basilica, from the laying of the first stone to its consecration (1875-1919). Visiting Sacré Cœur has become an essential part of any trip to Paris, and with good reason: from the front of the Basilica you can see the entire city of Paris. But it isn’t just an historic monument: it is still a place of worship to this day. In fact, its classification as a ‘Basilica’ means that it is a place of pilgrimage. Sacré Cœur is 278 feet high and 114 feet wide, and its dome is 180 feet high and 52 foot in diameter. The basilica is built in a Romano-Byzantine style and includes a mosaic in the apse (it measures 5,112 ft2 and is famous for being one of the biggest mosaics is the world) which depicts a resurrected Christ dressed in white with a gold heart on his chest. It also has a large organ (considered to be one of the most remarkable in Paris), the ‘Savoyarde’ (a 275-foot tall church bell, the biggest in France), a crypt, and the dome, which takes 300 steps to climb – there is no lift! But once you are 656 feet up, you can appreciate the view that stretches for a 30-mile radius – the highest point in Paris after the Eiffel Tower. 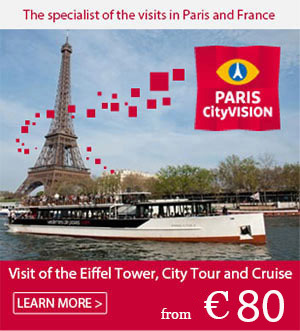 Why is it called Sacre Coeur? 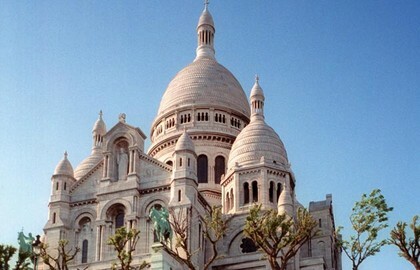 Have you guessed why it is called Sacré Cœur? When the basilica was built in 1870 France was at war with Germany. It was built for spiritual reasons and came out of a national vow to build a church dedicated to the heart of Christ as a penance for all the unfaithfulness and sin that had been committed. The Catholic Church believed at the time that the root of France’s problems was spiritual rather than political.